The Shitennou (the Japanese name for the Four Guardians of Master X) make up some of the most memorable new characters from the Zero series. Despite their being on opposing sides of a domestic war and harboring an intense rivalry with our protagonist Zero, somehow they were never quite our enemies. They sought peace while fighting tirelessly to serve humanity, protect their beloved homeland, and uphold the name of their world’s savior, X. By the end of Zero 3, it seemed they had finally wound up on the same side… And then they disappeared from the next game without so much as a mention. The series ended, but the Shitennou were nowhere to be found. What happened? 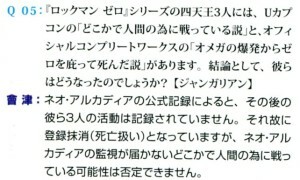 On June 23 back in 2005, U-CAPCOM answered a fan letter about the Rockman Zero series, asking why the Shitennou were absent from Rockman Zero 4. Their answer left many fans excited, for reasons you can surmise by reading the translation below. I finished Rockman Zero 4. Why oh why aren’t the Shitennou in it!? I really like the Shitennou! In fact, I love them!! The Shitennou are the reason I’m interested in Rockman Zero in the first place!! So why aren’t they in the latest game, huh!? Oh please oh please put all four of them in the next game!! Bring back Phanotom from the dead too!! Following the “EXE Corner”, were starting up the “Zero Corner”! This time, we’ve brought in the Rockman Zero 4 development team to answer this question. Thank you very much for your passionate support of the Shitennou. To tell you the truth, at first our plan was for Zero and the Shitennou to conduct their final decisive battle in Rockman Zero 3, a coup de grâce to be the crowning glory in the climax. However, all of the developers had gotten really attached to the Shitennou and their strong character, and several of us felt “It’s such a shame for the Shitennou to end up defeated like that!” So that’s why they wound up appearing in Rockman Zero 3 the way they did. Then Rockman Zero 4 rolls around, and due to Vile’s “Operation Ragnarok”, everyone in the world and the very future of mankind is in crisis. Even though they are bitter rivals, the Shitennou just wouldn’t be able to go chasing Zero around as they please in a situation like this. They are first and foremost “soldiers born for the sake of defending humans,” you see. So perhaps at the same time Zero was fighting his battle, they were off in other locations waging their own struggle to protect the humans. Honestly, we all regret not having been able to depict what happens next with the Shitennou in Rockman Zero 4, but at least this way all the Shitennou supporters out there have made their voices heard and let us know how popular they really are. We can’t promise anything now, but someday if the opportunity arises to report the adventures of the Shitennou to all you users in some form, we would like very much to do just that. So that’s the kind of thing you discussed going into Rockman Zero 3… Thank you for this priceless inside look behind the scenes! We’ll be looking forward to the day when the Shitennou’s activities can finally be brought to light. 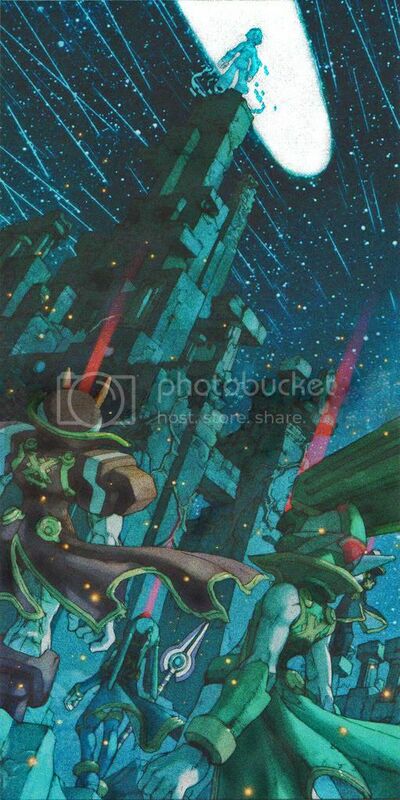 And so fans went on believing that while Zero’s story may have ended in Zero 4, the saga of the heroic Shitennou was a tale still to be told, especially when a certain image popped up amongst the goodies in the Remastered Tracks Rockman Zero 4 Physis album later that year in September, 2005. So now it seemed, they were all dead: sacrificing themselves to save their sworn rival, possibly some measure of redemption for their past sins under the despotic rule of Copy X. This was unexpected for many reasons, not the least among them that the ending of the game doesn’t seem to show anything like that happening. So that image that generated so much excitement, that was just a non-canon unsolicited service cut? Or was it their ghosts observing the event from the netherworld of Cyber-space? The very idea just seemed to fly in the face of what the developers had said before, and some frustrated fans felt that this untimely end to the trio was shamelessly tacked on by the game’s developers just to get the Shitennou out of the way so people would move on and concentrate on the new ZX series. 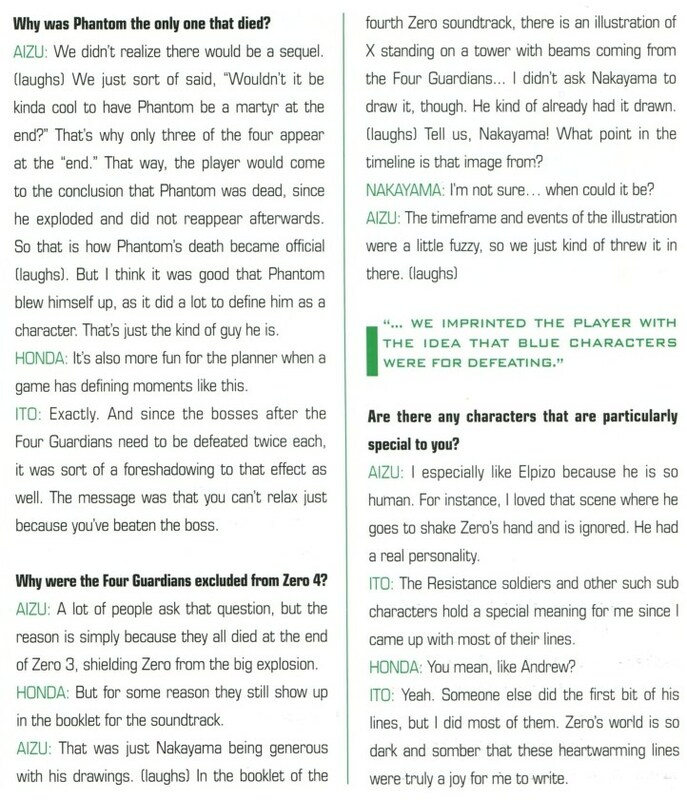 Well, like it or not, that the Shitennou had died saving Zero in the end of Zero 3 was the final official word on the subject. Until December 2012, when along came R20+5 and with it The Answer, where Inti Creates’ own Takuya Aizu changed his story yet again. 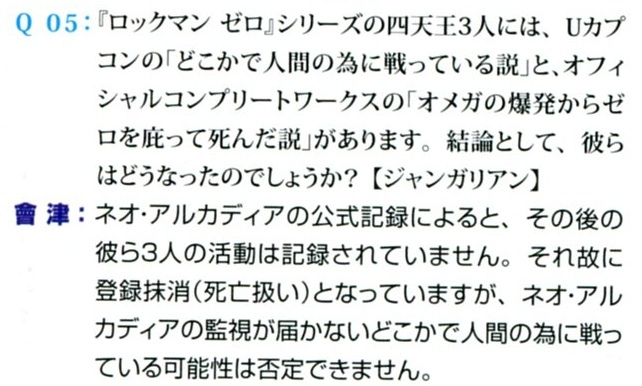 Q05: Seems there are 2 versions regarding what happened to the 3 Shitenou members from the Rockman Zero series: U-CAPCOM’s “they’re off somewhere fighting for the sake of humanity” theory, and the Official Complete Works’ “they died shielding Zero from Omega’s explosion” theory. So in conclusion, what really happened to them? Aizu: According to Neo Arcadia’s official record, there is no documentation of the three’s activities following that incident. Therefore their registry access was deleted (handled as if they were deceased). However, I can’t deny the possibility of them fighting for the sake of the humans someplace outside the scope of Neo Arcadia’s surveillance. So now they’re maybe… not dead? Or didn’t die there, at least? For now, like so much else in the realm of Rockman, it seems the ultimate fate of the Shitennou remains a mystery. Probably the kind where fans can believe whatever they want with neither contradiction nor confirmation coming to intervene. Then again, we may have a new answer in another couple years. As it stands, I think I’d rather their fate be revealed as a flashback in a new ZX title than a Shitennou spinoff game, but neither one seems too likely at this point. 19 Comments to "Fate of the Four Guardians"
Thanks for the translation, #20. I must say this is one case where I’m more satisfied with the lack of a conclusive answer. Shielding Zero from Omega’s explosion may seem noble in principle, but it’s a rather inglorious fate in practice. Perhaps Aizu came to the same conclusion and changed his mind? I suppose I wouldn’t mind a game based on the Big4. The Biometals of ZX may give a taste in terms of mechanics, but as much as I love the series, it doesn’t quite feel the same. 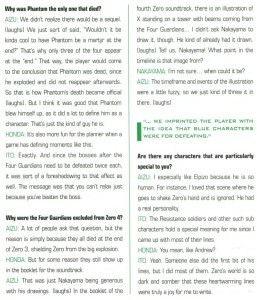 And I would be interested in seeing how the Four Guardians develop when they put aside their rivalry with Zero. That last thing you said does peak my interest, I must say. Is there life beyond Zero-rivalry? Of course, I think in some ways, their relationship as livemetals in ZX is exactly what that would be like, but we really only get fragments of that to go on. 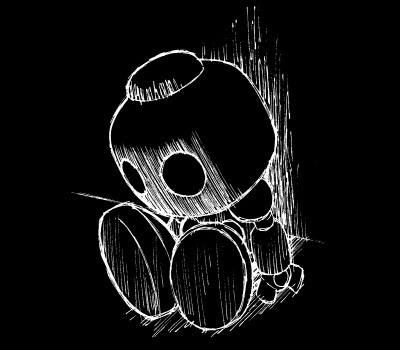 No matter if they die or didn’t die at the end of Zero 3, they die or their souls were transferred to some device found by Ciel at some point between Zero 4 and events that take place before ZX. Such a same that they couldn’t finish the ZX series, at least the Zero series ended in an epic way. Inti’s flip-flopped on this too, confused on what constitutes a robot’s soul. It’s probably not too far off to say that whenever there’s something controversial in the fandom, Inti isn’t sure what they mean and you can believe what you like. A topic for another day, maybe. I don’t feel like Inti’s flip-flopped on the matter of a robot’s soul. They’ve just grouped both DNA Souls and the Sigma Virus under the broader Cyber-Elf category. You can compare it to how Reploids are robots, but not all robots are Reploids. I’d like to go with the “they survived” answer, even if it doesn’t help explain why they’re later seen in Biometal form, ‘cuz come on–the Big 3 (out of 4) deserve better than “chumped by exploding Omega”. I like this reconciliation of ideas. That said: any chance you’ll ever translate any of Vile’s incident, #20? The latter half of that text is (like the ZX drama tracks) a complete unknown to most of the fandom. Never say never, but it isn’t on my short list. That Montagne is awfully wordy. I have to admit, I like this answer as well. Kind of works to allow both, in a way. This is why I don’t put much stock into the “We have an outline for what happens between classic and X” answer to begin with. I’m sure they could come up with something if necessity demanded. But the series has gone on so long and changed so many hands, I can’t imagine there’s been a single explanation in the background all this time. Even the origins of the Sigma virus, and how it works, have been reconsidered multiple times. And yes, thanks for the translations. I really should have started this as soon as I got the book, but it just… never popped into my mind as a thing to do. Incidentally, I think I saw that Command Mission was regarded as an alternative universe sort of thing? Did you cover that yet? For the rest Udon will probably step in with an official trans if we wait long enough. Do you have any favorites? Meijin’s answer to EXE 6 probably made me chuckle the most. Clearly he’s been thinking of that girl much longer than I have. Nah it’s cool, I’ve still only just glanced over them. Also I’m like a year behind in translating Phantom of Network. Belated projects piling up, I know that feeling well. Anyway, congrats on the N2! Looking forward to the rest of PoN! Will you still post more of The Answer, or are you leaving that one for the official UDON release? The Command Mission Q&A in particular has been much hinted at, and I’d love to see what this alternate universe thing is all about. Since the announcement, I’d been going back and forth over what was still worth doing. Far as I know, the book doesn’t have a release date, though even if it did pessimistic history teaches us to add at least 30 days to whatever we’re told. Maybe a short spoiler post is enough for people who don’t want to wait. Of course, impatient people already have no love for the update droughts around here. But since you asked, maybe that will be my last one. Gonna allow this because I’m slightly amused to be getting spam in Japanese. Got rid of the link though. What’s up with Japan and wedding dresses anyway? This is the third such relation I see in two days.